The issue of women in academia has been at the center of attention ever since Harvard President Lawrence Summers made his infamous speech about why there are fewer women in the sciences than there are men. In response to that speech, President Hockfield, together with Presidents Tilghman and Hennessy of Princeton and Stanford respectively, condemned discrimination against women in the sciences and in academia, and called for measures to make these disciplines friendlier to women. However, discrimination against women does not happen only in the laboratory or in the classroom. An institution’s support for women should also be measured by how committed it is to their health. 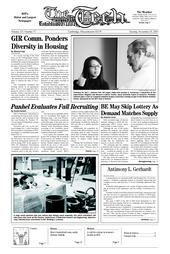 In 2003, MIT imposed budget cuts on MIT Medical that led to the dismissal of many medical staff and services. The Ob/Gyn department was one of the departments suffering dramatic loss of staff and expertise. Because of this, I would like to argue that it is the female students and employees who took the larger brunt of the cuts imposed by MIT. One may argue that many departments, not just Ob/Gyn, were affected by the staff cuts, and the effects would not just be felt by the female portion of the MIT population. However, in addition to enduring cuts in general departments such as dermatology and internal medicine, women bear the additional burden of enduring cuts in a department specific to their health. This represents a subtle type of institutionalized discrimination, where a subsection of the population is affected more heavily by a decision made in the administration. How specifically did cuts in the Ob/Gyn department affect women on campus? Firstly, with the reduced doctor to student ratio, gynecologists and obstetricians at MIT Medical in general are more rushed and stressed, leading to a higher incidence of misdiagnoses and decreased quality of care. As a personal example, for a simple ailment, I was consecutively misdiagnosed three times at MIT Medical before I was finally referred out to a non-MIT specialist. Secondly, it is not uncommon for a female student to have to wait for up to two months before she is able to see her doctor. Although in theory a woman may request to see a doctor sooner if the matter is urgent, in practice many women encounter unsympathetic staff who are reluctant to bother the doctor. This translates into prolonged waiting periods that are frequently spent in pain and frustration. The MIT Medical Task Force Report, which came out in October 2005, reports that patient satisfaction for Ob/Gyn services is lower for subscribers to the MIT Health Plan compared to employees who subscribe to other plans. In addition, for every three MIT health plan subscribers who answered the MIT Medical survey that the Gynecology service had gotten better, five subscribers answered that it had gotten worse. For faculty members, this ratio worsens to one satisfied subscriber to almost three dissatisfied. For MIT Obstetrics survey respondents, the rate of dissatisfaction soars even higher. Another section of the report describes how it is important for MIT to have an on-campus medical center to ensure employee convenience and productivity. And so, the following questions arise: In addition to cuts elsewhere at MIT Medical, how do the cuts in Ob/Gyn affect female employees’ overall productivity and convenience compared to that of males? And how productive can a woman be if she cannot get the right health care when she needs it? There are, in fact, many questions that need to be answered: How does patient satisfaction compare between men and women at MIT Medical? How does it compare between female students and female faculty? Since MIT Medical transferred part of its Ob/Gyn services off-campus to affiliate doctors at Mount Auburn Hospital, does it become more inconvenient for women to see these doctors? In practice, how many women see off-campus Mt. Auburn Ob/Gyns compared to on-campus staff? How does the MIT Ob/Gyn doctor to student ratio compare to those in similar academic institutions? How specifically have women been affected since the 2003 cuts? And with the statistics cited in the Task Force report, can MIT Medical now justify its previous claim that Ob/Gyn service cuts would not affect women on campus? With the recommendations of the Medical Task Force and a new female president, now is an auspicious time for MIT to set up an investigative committee to look into issues affecting women’s health on campus. The MIT and MIT Medical administrations should collaborate to document women’s experiences and come up with solutions to declining care and negative perceptions of the MIT Ob/Gyn department. In this way, MIT can tangibly affirm its commitment to women and MIT women can proudly promote their alma mater as a discrimination-free environment. Aliaa H. Abdelhakim is a graduate student at MIT.